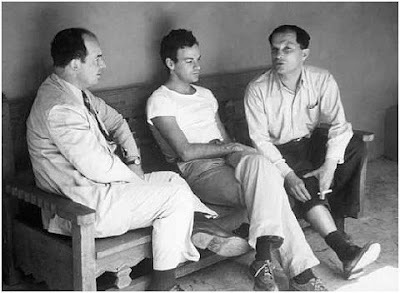 The picture above is of von Neumann, Feynman, and Ulam. More Ulam. See also the nature of intuition and intuition and the two brains. Adventures of a Mathematician: (p.147-148) ... the main ability to have was a visual, and also an almost tactile, way to imagine the physical situations, rather than a merely logical picture of the problems. The feeling for problems in physics is quite different from purely theoretical mathematical thinking. It is hard to describe the kind of imagination that enables one to guess at or gauge the behavior of physical phenomena. Very few mathematicians seem to possess it to any great degree. Johnny [vN], for example, did not have to any extent the intuitive common sense and "gut" feeling or penchant for guessing what happens in given physical situations. His memory was mainly auditory, rather than visual. Another thing that seems necessary is the knowledge of a dozen or so physical constants, not merely of their numerical value, but a real feeling for their relative orders of magnitude and interrelations, and, so to speak, an instinctive ability to "estimate." I knew, of course, the values of constants like the velocity of light and maybe three or four other fundamental constants—the Planck constant h, a gas constant R, etc. Very soon I discovered that if one gets a feeling for no more than a dozen other radiation and nuclear constants, one can imagine the subatomic world almost tangibly, and manipulate the picture dimensionally and qualitatively, before calculating more precise relationships. Most of the physics at Los Alamos could be reduced to the study of assemblies of particles interacting with each other, hitting each other, scattering, sometimes giving rise to new particles. Strangely enough, the actual working problems did not involve much of the mathematical apparatus of quantum theory although it lay at the base of the phenomena, but rather dynamics of a more classical kind—kinematics, statistical mechanics, large-scale motion problems, hydrodynamics, behavior of radiation, and the like. In fact, compared to quantum theory the project work was like applied mathematics as compared with abstract mathematics. If one is good at solving differential equations or using asymptotic series, one need not necessarily know the foundations of function space language. It is needed for a more fundamental understanding, of course. In the same way, quantum theory is necessary in many instances to explain the data and to explain the values of cross sections. But it was not crucial, once one understood the ideas and then the facts of events involving neutrons reacting with other nuclei. This "dynamics of a more classical kind" did not require intuition for entanglement or high dimensional Hilbert spaces. But see von Neumann and the foundations of quantum statistical mechanics for examples of the latter. The ability to visualize problems is something that many high V people never master, although many of them could if they put in the effort. I credit my organic chemistry courses with forcing good visualization skills on me. Discussing monetary crises with some lawyers, I came upon the idea of plotting money on a two dimensional grid with one axis labelled portability and the other labelled liquidity. We could in principle add all the other dimensions that define money. On my two dimensional grid, I explained that there was an area in the high portability, high liquidity region of the surface that defined money. Furthermore, the boundaries of money could change in time and we could easily visualize the definition of money changing in this third dimension. Finally, we could add individual assets to this grid and watch them move into and out of the area defining money as time went on. Right there, we had a good visualization of how some monetary crises happen. It seemed to go right over the lawyers' heads. They had a good grasp of the basic concepts but they seemed averse to visualizing it. Nothing beats Geometric Algebra (real-valued Clifford Algebras with physical interpretations) for bridging the gap between visualization and equations. It not only is visualizable, and has a structure that matches what it is representing more closely than matrices / tensors / etc. do, but it is general enough handle nearly any area of physics using a single formalism. For this you went to Harvard?